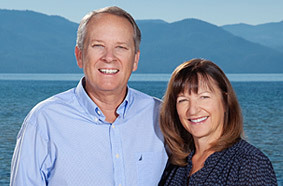 Real estate agents, Bill and Nora Leeder, have been specializing in North Lake Tahoe real estate for both North Lake Tahoe and West Lake Tahoe communities for over 20 years from their Lake Tahoe Real Estate Co. office and now from their Tahoe City office with Oliver Luxury Real Estate. In addition, they service the nearby communities of Squaw Valley, Alpine Meadows and Truckee. They also specialize in Lake Tahoe luxury homes and Tahoe Lakefront real estate. Their motto is “The Right Agent Makes All the Difference!” Customer satisfaction is our #1 goal. If your plans involve a relocation to Lake Tahoe area or your searching for that perfect second home, let us show you the very best of Lake Tahoe! Choosing the right realtor for selling or buying your Lake Tahoe home can make a difference…. Let our service prove it!